I’ve noticed something over the past few years. I love to cook. As the main hunter and gatherer of the family, I cook and meal-plan out of necessity. But, over the years, a little hobby has developed and I am loving it. I don’t create a lot of recipes as I tend to be a follower when it comes to ingredients. That said, I’ve been getting a bit more brave and creative in the kitchen. I just made shrimp tacos. This is not a drill!!! Will blog after I stuff my face. ???? 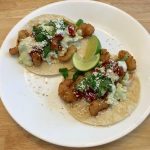 Last month, I made some delicious popcorn shrimp tacos using a recipe I found online. They were really good but I knew I wanted to make some changes for the next go around. This time, I am sharing my recipe with you! The best part about this meal is the avocado-lime slaw. You can make it and eat it right away, but if you have time to let it sit for a few hours I highly recommend it. It’s so tasty! Once you’ve made the slaw, all you need to do is bake the shrimp and put it all together. 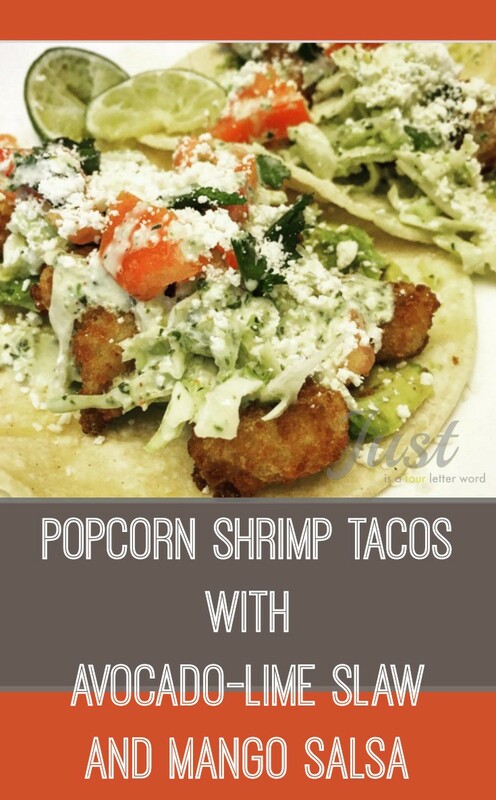 I think it’s safe to say we’ll be seeing a lot of popcorn shrimp tacos this summer! Add avocado and cilantro to food processor and pulse until fine. Pour in oil, water and lime juice (to taste - between 1 and 2 limes). Add sour cream and pulse until blended. Refrigerate for several hours or overnight. Heat tortillas and layer slaw, shrimp, mango salsa, cheese and cilantro. What are your must-have summer meals? I’d love to hear what you are cooking up these days!